Mark Zuckerberg and Bill Gates both spoke about the rise of robotics technology to college graduates this June. What would be your advice for those just starting their careers right now? Apply your passion to using and working with technology and companies that will disrupt the status quo. Over the past decade, whether you were an accountant, engineer or hourly worker, you would have been better off employed by an innovative company like Google rather than a stale IBM. Technological disruption will occur at a faster rate over the next decade. Avoid working for a dinosaur company or within a legacy sector of the economy. Do you think robotics will put so many people out of work that it will cause hardship and a major disruption to our society? It will depend on the resilience of the overall economy. Export driven countries like China, that rely on a low labor cost comparative advantage will undergo a much harder time than a diversified economy like the US. Technology has always caused hardship to workers in disrupted industries. What will be more pronounce this time, is that the displacement will not be localized. Unemployment won’t be confined to a region of the country or an out-of-favor sector of the economy. In the 1980s it was the Rust Belt; in the 2000s it was the publishing sector. Over the next decade, the threat of unemployment will be boundless. Social unrest will most likely be avoided in the US by implementation of some type of universal basic or guaranteed minimum income. This isn't the first time an economy has changed due to technological innovations- what lessons should we be taking from history? The Luddites were 19th century English weavers that feared losing their jobs to industrialization of textile mills. In the aggregate, Luddite fears were unjustified because the industrial revolution created more jobs than were destroyed. The lesson of the Luddites is that although the economy will eventually balance, short term those that are adversely affected will be unhappy and uncooperative. Just as the Luddites opposed technology, rioted and destroyed property, expect disaffected workers of the future to behave in a similar fashion. The difference this time is that the US economy is largely service based rather than manufacturing. So the disenfranchised will more likely be the white collar professional rather than the laborer. Which robotics innovations will have the biggest industry impact in the next five years? How about 10? Over the next five years automation will impact sectors of the economy that have been insulated from change by social norms or regulatory barriers to entry. This will occur because technological solutions are readily available but not yet deployed. As Uber has disrupted the medallion protected taxi cab industry, expect consumers to start using apps and smart devices to navigate around established institutions like medicine, education and government. Over the next 10 years the industrial base of North America will have greatly expanded with many manufacturing facilities relocating to the US, Canada and Mexico. Factory automation will drastically reduce the cost of labor, as the digital age made information near free, thus disrupting the comparative advantage of exporting countries that have relied on low cost human labor. Low cost energy, especially in the form of natural gas, will further incentivize the renaissance in North American manufacturing. Robotic factories will be located as close to the wellhead as possible or along pipeline corridors that stretch north-south from the Dakotas to Texas, and west-east from Utah to New Jersey. No. Every sector of the economy will be disrupted by automation to the extent that jobs within that sector are predictable, routine and repetitive. For example, medicine is a vibrant sector of the economy, yet much of it could be disrupted by automation and artificial intelligence, especially routine diagnostic work. What doctors are most at risk? The pediatrician that diagnoses strep throat; the radiologist that reads x-rays; the anesthesiologist that administers routine non-invasive procedures. Medical professionals unlikely to be replaced by a robot would be the resourceful emergency room doctor or the empathetic oncologist. There are those who say the robotics revolution won't come about in customer facing fields because people don't actually like dealing with robots for customer service. How would you respond to this critique of the robotics revolution? Consumers prefer convenience and they will choose a useful robot over an ineffective human. Currently kiosks and self-checkout devices are rudimentary at best, once they become more efficient, they will replace human workers. Do you prefer to renew your driver’s license online via automation or do you enjoy the human-to-human experience of waiting in line at the department of motor vehicles? Customer facing jobs are important but humans only have the edge when they are performing tasks they are best suited for- things like creativity, spontaneity, and empathy. What do you feel are the best possible outcomes for the robotics revolution? The best outcome would be a slow adaptation that ushers in the efficiency of automation without creating widespread unemployment. In general, I believe that’s what will occur in the US. Autonomous vehicles won’t be as easy to implement as robotic welders on an assembly line, because the roads and highways are much less predictable than the factory floor. On the other hand, middle managers will progressively be replaced with enterprise software solutions like SAP or SalesForce, as they have been since the recession of 2008. In the US, manufacturing jobs have been in decline since 1957, a similar fate will await the service sector and white collar jobs. Societal impact will most likely be softened by some type of unemployment subsidy like a universal basic income. 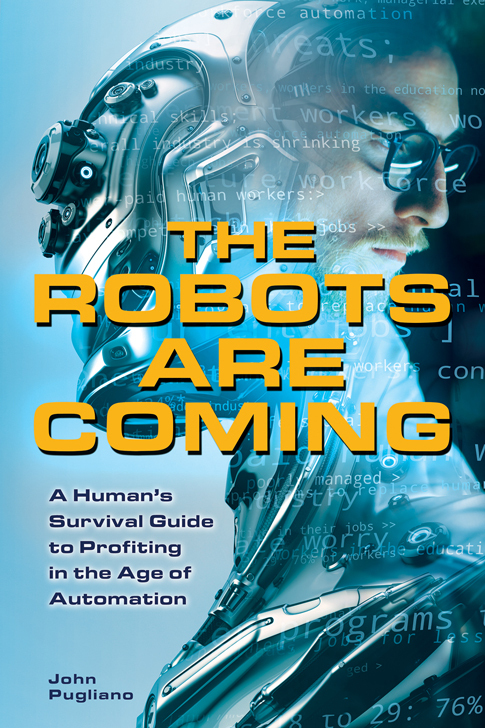 John Pugliano is the author of the recently published book The Robots are Coming: A Human's Survival Guide to Profiting in the Age of Automation. He is a professional money manager and shares his investment philosophy and stock market commentary on the Wealthsteading Podcast.